Ratequeue is an internally-developed distributed queueing system designed for simultaneously rate-limiting dequeue rates for many ephemeral queues. Each sender ID (e.g. phone number, short code, Alphanumeric ID) is given an ephemeral queue and contains all messages that are queued for delivery. Ratequeue uses Redis as the main data store for creating and maintaining queues. We have horizontally partitioned our Redis data (also called sharding) by having each Ratequeue instance run its own local Redis store. This means that data is isolated from each Ratequeue shard and when one shard fails, the data on other shards are not affected. Additionally, each Ratequeue shard is deployed with a primary and a replica so that we do not lose messages when hosts fail. We had previously designed and developed a failover mechanism for when a Ratequeue primary node encounters an unrecoverable fault. However, an on-call engineer was still required to choose a replacement primary and initiating the replica promotion. This is time consuming and introduces the risk of human error to this critical service in the Programmable SMS stack. Congrats, Ratequeue cluster is healed, back to sleep. While the failover steps itself are not very complicated, it is still a manual process done by the on-call engineer which introduces room for human errors. This process can take 20 minutes or more for a human to debug and recover the cluster, causing messages to be delayed for a long period of time. Since Ratequeue is a critical service, the team recognized automating the failover as a high priority, so we put a plan in motion to solve this. Coming into this project, we had 3 system design goals in mind. If we determined the primary to be down, but it’s really not (network partitions, etc), the primary will automatically go into a draining mode when out of load balancer and enqueue it’s items to other healthy shards. The Ratequeue replica box pings the health check on the corresponding primary host every 10 seconds and publishes the result of the healthcheck to our Nagios server. 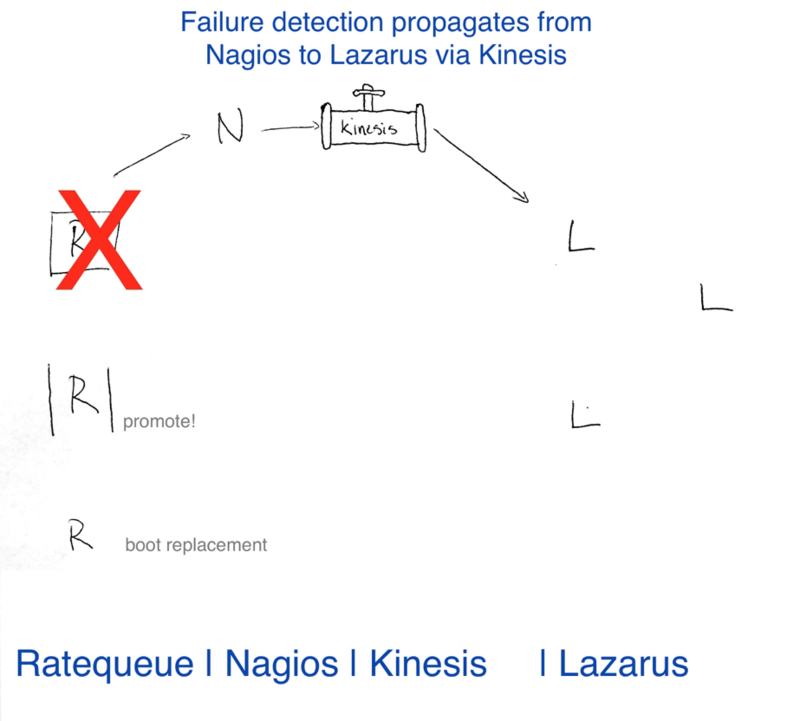 When Nagios receives 3 failures from the replica host, it publishes a notification to Amazon Kinesis. Our cluster automator service, Lazarus, dequeues events from Kinesis, validates the events and the state of the entire cluster, and then executes a specified workflow to remediate the failed host. Booting a new Ratequeue replica host with the same shard tag. With this system, we were able to achieve all three system design goals and detect failure in just ~30 seconds. The complete automated failover completes in a little over a minute! After implementing Ratequeue HA, we needed a way to validate that failures were being detected and recovered properly. To accomplish this, we designed a tool called Ratequeue Chaos. 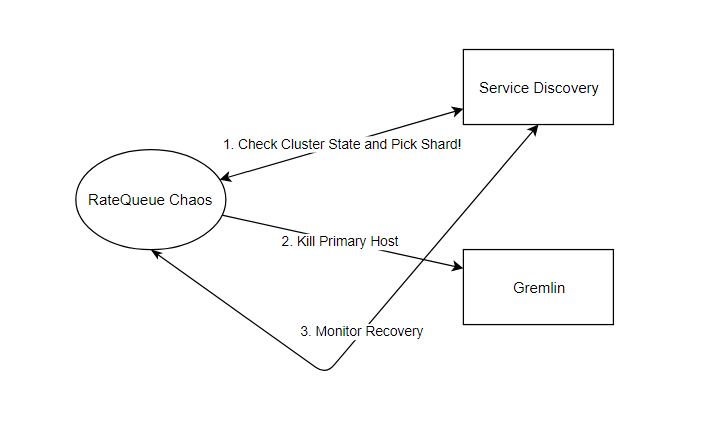 Ratequeue Chaos uses our service discovery system to obtain information regarding the state of the Ratequeue cluster. It ensures that there are at least 2 healthy shards of Ratequeue running before picking one of the shards. Ratequeue Chaos starts a shutdown attack using the Gremlin API on the selected shard’s primary host. Gremlin’s API tells us the attack started successfully, and Ratequeue Chaos begins to monitor for the failover process. Using our service discovery, we monitor and wait for the failed primary host to exit the load balancer. Next, we monitor the new Ratequeue primary (promoted replica) to enter the load balancer. When the new primary enters the load balancer, the Ratequeue cluster is now deemed healthy. We run Ratequeue Chaos in our staging environment every 4 hours and have had great success catching bugs that we did not anticipate. The key to a successful chaos engineering test is to have a hypothesis you’d like to test. In our case, we wanted to see if Ratequeue would self-heal if a primary host shut down. It’s a simple test we can run to see if the system is resilient or if we need to go back and fix some couplings. The next thing you need is to have a framework to measure your tests. It’s important to have a performance metric that you’re looking to improve. In our case, it’s availability of Ratequeue without human interaction. Finally, you need to have a rollback plan. In this instance, we’re running Ratequeue Chaos on staging. If Ratequeue Chaos detects a failure in our staging environment, we can have an engineer manually intervene without impacting our customers. If you run tests in production you’ll want to have a plan to revert to normal state. 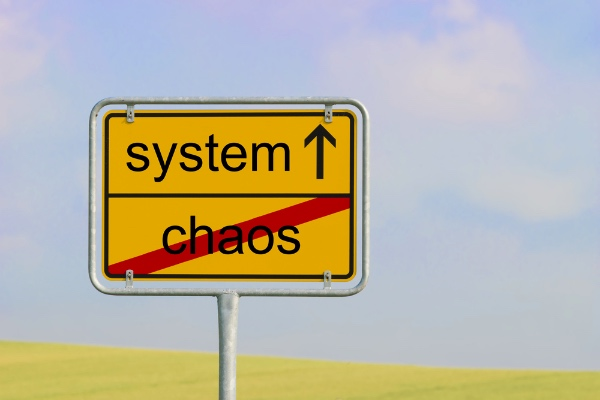 With the increasing complexity and unpredictability of distributed systems that the industry is adopting, we highly recommend practicing chaos engineering wherever possible to test for coupling and increase your system’s resilience. After implementing Ratequeue High Availability and Ratequeue Chaos, we saw our first automated failover in production a few months ago complete in a little over a minute. We are confident that we can lose one of these shards at any point.